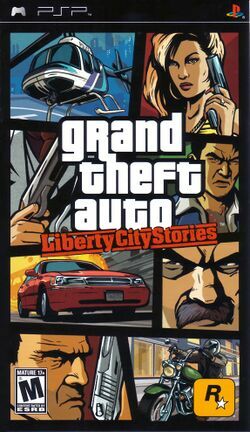 Grand Theft Auto: Liberty City Stories is a non-linear driving and shooting game released by Rockstar North on October 25, 2005 for the PlayStation Portable. A PlayStation 2 port was released on June 6, 2006 without support for multiplayer game modes to the PlayStation 3 release date on April 2, 2013. The iOS released on December 17, 2015. and the Android released on February 11, 2016. As the title implies, the game involves an amount of crime and plenty of carjacking. There is a sequel to this game, called Grand Theft Auto: Vice City Stories that is also on PSP. The game takes place in Liberty City, 1998, before the events of Grand Theft Auto III and Grand Theft Auto taking place in 2000 and 2001. You start out playing as Toni Cipriani, a made man and Capo for the Leone Mafia family last seen in Grand Theft Auto III, returns to the city after a period of "laying low", having killed a "made man" before to the approval of don Salvatore Leone. Upon arrival, however, he finds that the Leones have moved on with business and Toni's position as Capo was seized by another member. Starting again as a low ranking goon of Salvatore's mob, Toni must once again work his way back up to his former position as the second-in-command to the don. You, the player, will assume the role of Tony Cipriani upon arrival in Liberty City. This page was last edited on 7 January 2018, at 09:41.